Home » Civil Protection Orders » Do I Need a DC Criminal Defense Attorney? The police come to your home or your place of business. They say that they need to speak with you, or maybe casually ask if they can “take a look around.” They’re friendly, non-threatening, and tell you they have a few questions and just want your help clearing up a few things. They may even request that you come with them to the station where you can all be more comfortable. You’re not sure if you’re a witness to something, the target of an investigation, or under arrest, and though you ask the police questions about what’s going on, their answers are vague and they’re not giving you any information. Understanding your rights and what you should and shouldn’t do is your best and most powerful tool if and when the police want to interview you or conduct a search of your property. And your most important right is to have the assistance of a DC criminal defense lawyer. When should I call a criminal defense lawyer? Real police interrogations are not like those you see on TV. Law enforcement only needs to read you your rights, the Miranda warning we’re all so familiar with, if you are in custody. Anything you say to the police, inadvertently or in a conversation, can be used against you whether you’ve been “read your rights” or not. Trying to be helpful and answering questions, or trying to explain your situation is never a good idea, and a criminal lawyer will make sure that you don’t say something that could hurt you later. A knowledgeable and experience criminal defense attorney’s first job is to protect your rights, and they understand that a mistake, even before an arrest takes place, could be the difference between charges filed or not. You are read your rights – Once you hear the Miranda warning, you are being arrested. Say nothing other than “I am asserting my right to silence.” Words are your enemy. You have the right to call an attorney or have a lawyer provided to you. Use that right. Once you’ve invoked your right to an attorney, the police can no longer question you without your lawyer present, so sit quietly and wait. The one exception is that you should provide only answers to biographical questions like name, date of birth, address, etc. Police must process your arrest for you to get released. Its also extremely important that you remain polite and respectful at all times. Police want to conduct a search – Whether law enforcement has a search warrant or not, there are rules that apply to a legal search. The police can’t just go crazy and tear up your property looking for anything that might be incriminating. You should be told what they are looking for and what might be removed from the premises. If the police don’t have a warrant, they need your permission to search your property. A criminal defense lawyer will tell you, even if only over the phone, what you should and shouldn’t do. The police want to bring you in for questioning – This is a red flag and should be cause for concern. Law enforcement wants you on their territory where they can control the situation. Call a lawyer immediately and don’t answer any additional questions until your attorney arrives. 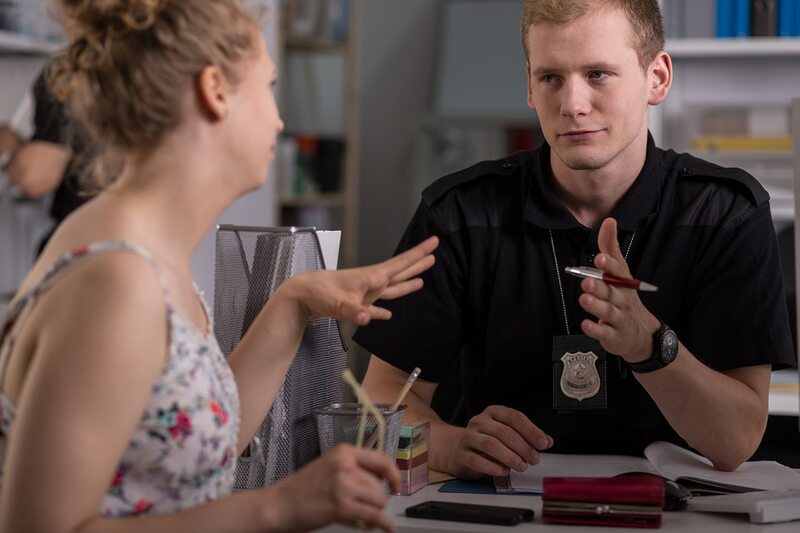 Questioning changes…and not for the better – The tone or attitude of the officers’ questions changes and becomes more strident, accusatory, and less “friendly.” New personnel come in to question or accuse you. You feel uncomfortable and the situation begins to feel out of control. Trust your instincts, stop talking, and call a criminal defense lawyer. You don’t know if your situation needs the help of a criminal defense attorney – Something is scaring you or making you uncomfortable. It’s time to err on the side of caution and call a lawyer. Often, people are afraid that if they call or hire a criminal defense lawyer that they are admitting fault or guilt. Hiring an attorney is the way that you protect your rights and it cannot be used against you. It is important that you defend yourself in the best way possible, whether you are arrested or just being questioned. The right time to call a criminal defense attorney is as soon as you have an encounter with the police. Don’t wait until formal charges are filed against you to seek legal help. Every minute you wait to contact an attorney is an opportunity to make a mistake that may jeopardize your case and your freedom. Remember, they cannot legally punish you for exercising your rights. If you’re looking for an experienced criminal defense law firm that will fight for your rights throughout the criminal process, contact Jay P. Mykytiuk, Trial Attorney. Mr. Mykytiuk has successfully represented individuals throughout Washington D.C. who have been arrested and charged. Contact us today at 202.505.5863 to discuss your case.